^ Peattie 2007, p. 9. ^ Peattie 2007, p. 17. ^ Peattie 2007, p. 19. ^ Peattie 2007, p. 103. ^ Gilbert 1989, p. 135. ^ Tagaya 2003, p. 5. ^ 坂井 2000, pp. 159-160. ^ Francillon 1979, p. 50. ^ Francillon 1979, p. 546. ^ Francillon 1979, p. 52. ^ Francillon 1979, pp. 51-52, 549-557. ^ Thorpe 1977, p. 15. Francillon, Ph.D., Rene J. Japanese Aircraft of the Pacific War. London: Putnam & Company Ltd., 1979. ISBN 0-370-30251-6. Gilbert, Martin (ed.). Illustrated London News: Marching to War, 1933-1939. New York: Doubleday, 1989. 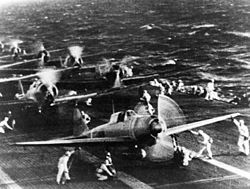 Peattie, Mark R. Sunburst: The Rise of Japanese Naval Air Power, 1909-1941. Annapolis, MD: US Naval Institute Press, 2007. ISBN 978-1-59114-664-3. Stille, Mark. Imperial Japanese Navy Aircraft Carriers, 1921-45. Botley, Oxfordshire, UK: Osprey Publishing, 2005. ISBN 1-84176-853-7. Tagaya, Osamu. Imperial Japanese Navy Aviator, 1937-45. Botley, Oxfordshire, UK: Osprey Publishing, 2003. ISBN 1-84176-385-3. Tagaya, Osamu. Mitsubishi Type 1 "Rikko" 'Betty' Units of World War 2. Botley, Oxfordshire, UK: Osprey Publishing, 2001. ISBN 978-1-84176-082-7. Thorpe, Donald W. Japanese Naval Air Force Camouflage and Markings World War II. Fallbrook, CA: Aero Publishers, Inc., 1977. ISBN 0-8168-6583-3 (hardcover, paperback ISBN 0-8168-6587-6).